Do people call you an old soul? Does your CQB kit need something that can reach out and hit someone farther than your spring shotgun can reach? Are you tired of players not calling their hits because they didn’t feel it? Looking for a little more realism? It’s time to add an airsoft revolver to your loadout. Here you’ll find a list of airsoft revolvers in different categories plus one that beats out all the others. What airsoft revolvers lack in magazine size and fire rate, they make up for with accuracy and range. What’s Special About Airsoft Revolvers? Before you consider anything else, you need to know the single biggest limitation with airsoft revolvers. 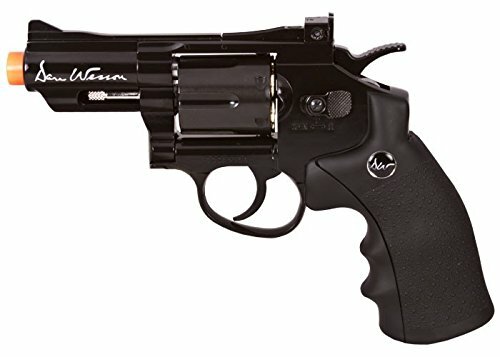 Most quality airsoft revolvers fire at over 500 FPS. This means most indoor fields will not let you run a revolver. If the only fields nearby are indoors, most airsoft revolvers are not for you. Airsoft revolvers will shine in an outdoor field, especially with heavier weight BBs. When you take it to the enemy in close quarters, you may feel naked if you spot an enemy outside of your range. While most airsoft revolvers don’t have a hop-up unit, the extra FPS will make hitting targets easier. The long barrels of some revolvers also contributes to their range. This brings us to another limitation airsoft revolvers have. Like their firearm counterparts, most only load six rounds. This means less room for error and more reloads. You can’t spray-and-pray like you can with an AEG with a hi-cap magazine. And your reloads will be like nothing else you’ve handled on the field. Personally, I enjoy reloading my airsoft guns on the field. Loading airsoft revolvers is a special joy since it mimics the real world. Some come with shells that you need to hand load. Others have thin cap gun-like loaders. The best ones come with speed loaders you can add shells to and load like the real thing. You’ll need to take care not to lose those shells, though. They are small and round and may roll. There are replacement shells available for most airsoft revolvers. They’re usually not too expensive. Still, you don’t want to have to replace them. The shells are durable, though and won’t break on a drop during reloads. Having fewer rounds ready to fire actually teaches you accuracy. You’ll value the shots you take more. Early in my airsoft career, I got a spring action shotgun that only had 10 shots to each reload. I had to learn which shots I could hit and which ones not to take at all. The experience you have with the smaller magazine will help you when you pick up your rifle again. You will have learned the value of each of your shots. One thing you’ll like about airsoft revolvers is part of what makes the firearms popular. The systems that power revolvers are uncomplicated and have few moving parts. This means fewer parts that can break and disable your airsoft gun. For the most part, take down and maintenance is easy. All of the revolvers on this list fire in both double and single action.You can either pull the hammer back for each shot like your favorite western hero or you can pull the trigger like everyone else. Because of this, you will be able to use an airsoft revolver for training without having to spend money on ammo. Black Ops is known for making respectable airsoft guns at great price points. You’ll usually find them on shelves in your local big box stores. Their CO² powered Exterminator 4” revolver is almost all metal, except the grip. Though the rugged build may not be in the best finish, it’s still full metal. Most airsoft pistols at this price point are made of a plastic polymer that’s easily cracked. The railed upper frame is ready to accept an optic. This Black Ops Exterminator is a good choice if you’re playing outdoors and you don’t have the deepest pockets. The issues with this gun are all cosmetic. While it’s nothing fancy like you’ll see later, has an attractive price. The fully licensed ASG Dan Wesson line has the highest of standards for realism. The weight is accurate, the trademarks are there. And the metal build is top of the line. The matte black finish on this snub nose revolver will stand up to combat conditions on the field. This one is heavy but small enough to fit in the pocket if you’re trying out a bare-bones loadout. While the price tag of this snub-nosed pistol is a little high, this revolver will not disappoint. You get what you pay for. Expect to impress others and yourself with this stubby airsoft revolver. If you’re like me, a snub nose is not the way to go with revolvers. If I’m going to own something that fires at 500 FPS, it needs to look like it can. 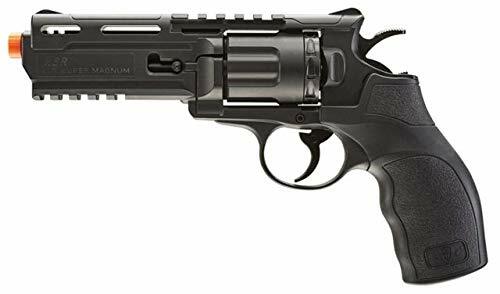 The WinGun 8” Magnum is an authentic option if you’re looking for a hand cannon. The full metal construction feels just right in the hand. Everything you need is in this package except for the CO² cartridges. Anyone on the opposing should team count themselves lucky if they see a teammate take a hit from this revolver. The high FPS and long barrel combined with heavier BB weights make this revolver the perfect pocket sniper. With the included upper rail, you can attach a magnified optic to help spot your targets. The only problem you will run into then is how to carry this airsoft revolver. Once you’ve handled the WinGun 8”, you’ll start looking for a revolver belt to complete your revolver loadout. The CO² powered Elite Force H8R is definitely your go-to revolver if you want to play with one indoors. Its heavy polymer frame will stand up to the punishing conditions on the airsoft field. It has a railed upper and lower frame for full integration of your tactical accessories. The sleek matte black finish and futuristic design make it intimidating on the field. Another thing that sets this revolver apart from others is its locking cartridge compartment. The H8R’s fastener stays attached to the gun, so there’s no chance you’ll lose it. The things holding this revolver back are definitely not enough to outweigh the low price tag for a CO² gun. Its FPS makes it one of the few gas powered airsoft revolvers you can run indoors. For an airsoft gun to make the top of any of our lists, it has to be usable. With its lower FPS, you won’t see the long-range effectiveness with other revolvers. Still, the ability to take this revolver indoors is why the Elite Force H8R tops this list. While the other revolvers on this list have the full power expected of their class, they don’t top this list because of their limited use. 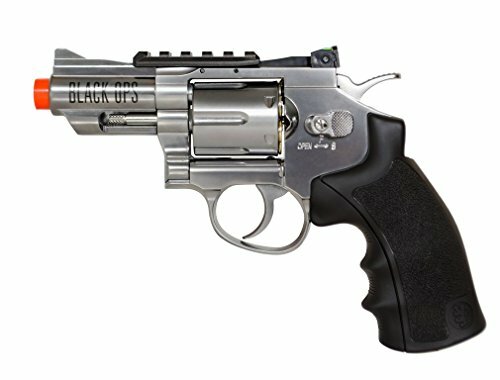 If you’re looking for hand cannon status airsoft revolvers, you will find them. Very few revolvers are both safe for indoor play and have any quality. When you carry your revolver onto the field, you bring with you the spirit of the American western frontier. You’re a real shootist. You count your shots like Harry Callahan and remind others that every player’s got to have their limitations. Whether you choose shiny chrome or matte black, you’ll be one of the happy airsoft magnum force.